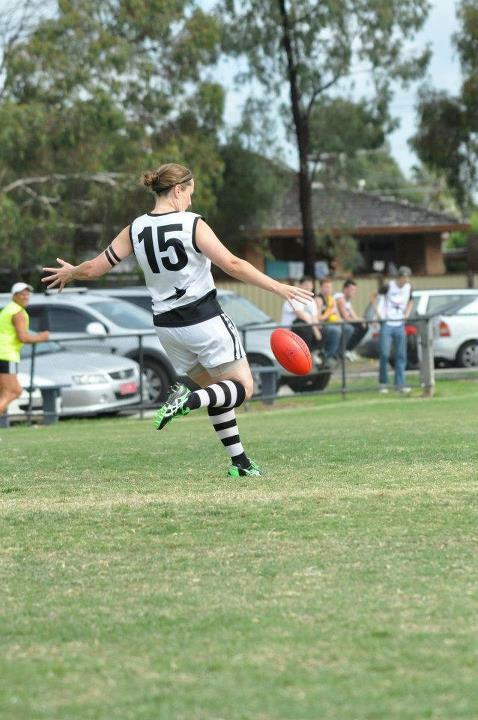 Louise “LG” Grant will joine her great mates Lou Wotton and Brooke Fox in the 150 club this weekend when she lines up against St Kilda at East Burwood Reserve. In her typical understated style LG isn’t wanting to make a big deal of things although she did say “I’d definitely like to win!” After starting her football in a forward pocket in 2000 she soon developed into a classy on-baller with skill, knowledge and fierce determination. She is a Life Member of the Devils and has previously been named Players Player and Best Club Person. Away from the Devils she has pulled on the Big V at two national carnivals and has played for Vitoria Metro on two occassions. As a Devil many of her games have been spent at the feet of ruck Lou Wotton who said “She is one of the smartest footballers I know. She is always thinking two or three steps ahead and her instructional talk is second to none.” Many of those who have played alongside LG say they are a better player when she is out there, which is one of the greatest complements a footballer can receive.